Just got her and not sure how old she is or what type of pit she is. If you can help me with any of those, it would be great. Love love my new pit!!!! She looks VERY young to me. (Possibly a little too soon to be taken from her momma.) But, it's really impossible to tell from a photo. The best estimate will be from her vet when you take her in for her first visit. Enjoy her babyhood. It passes by quickly. She is adorable. I dont know if there is A KIND of "pit", maybe colors are what you hear most about them as in a blue or rednose, chocolate or red & white or blue & white but a kind I dont know of a kind. There are true Amstaffs terriers or American Pitbull terrier but generic "pit" is really a name for the block head square nose thick dog that can have a wide variety of mixes now really unless it is papered or registered as a "pure bred". Many people have mixed the Amstaffs with Mastiffs or bull dogs to make them huge or thick but original pits were only about 35 to 50lbs. 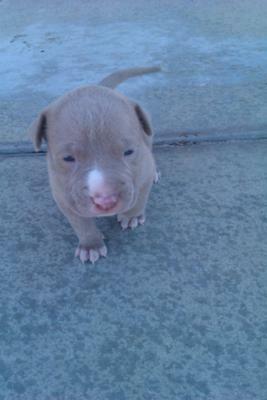 I have a red female but with blue skin as her momma was a black tan brindle. Her big brother is a huge blue brindle. Their dad is a red nose. Your little sweety it's hard to tell but from the picture looks like it'll be tan or a light chocolate even. It does look only about 6 wks in the photo which is quite young to be taken from it's momma. I'd make sure it gets good puppy chow & maybe supplements with calcium since it won't be nursing anymore so it'll have strong bones & teeth. I'd get it checked out & wormed for sure & see how old they feel it is as it may be too young for it's first set of shots still. Good luck with your new sweetie pie & teach it manners & socializing skills early! I cannot tell if Diamond looks the age of my Pit Peanut when I rescued him from a shelter. He was larger than Diamond and he was estimated at 3 months old. Thus, I believe Diamond is much younger. Do not worry about her breed, background, etc. Just start giving her unconditional LOVE. Feed her well, keep her indoors if you can (we have a leash law here) and soon she will be your loyal and loving" dog". Pit Bulls are the BEST breed anyone can have. Be prepared for plenty of kisses from her as she grows and she will also become a "lap dog". My Peanut is a red nose brindle and alot of folks say he is purebred. BUT, makes no difference. Peanut has now become my "Mobility Service" dog. I have a vest for him and ID card and I can take him anywhere...by law. Now think about that. A Pit Bull service dog !! Cesar Milan said I could make him into a service dog, and he was right. GOOD LUCK with Diamond and make no big deal about her being a Pit. She is your pet, companion and unconditional love dog ! Believe me, people will approach you and say "IS THAT A PIT BULL ". Most can usually tell.